I just received the approval letter, but I don’t know how long it’ll take to show up in the app store. I spent all afternoon working on a bug where the up button will occasionally get stuck, ending your game prematurely if you’re not quick enough to pause or hit the physical home button to “unstick” it. I hope the bug is not terrible to play with, but I’ve already submitted the update to apple, and I think the way the up button works now is a significant improvement. Also in the update is a new menu image. The designer of my chess pieces, Peter Wong, saw the previous menu image and sent me an upscaled version without my even asking! Anyway, hopefully apple won’t take a week to approve the update. 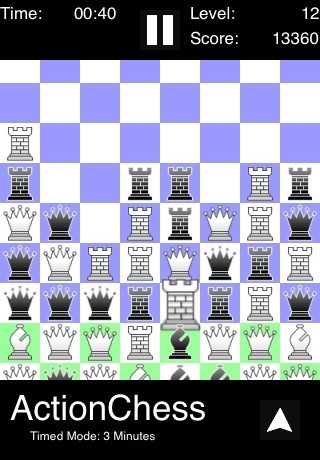 For ActionChess, I’ve licensed Peter Wong’s awesome Chess icons available over at http://www.virtualpieces.net/. The icons are available for download for “personal use” as icons on your computer in a variety of formats. 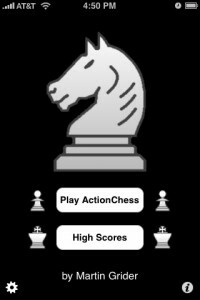 Hopefully ActionChess puts them to good use!